KIEV, Ukraine -- It wasn’t supposed to be like this. Nearly two years after Ukrainian protesters drove out their pro-Russian leader, progress toward building a European-style state has disappointed and the post-Soviet scourge of corruption endures. 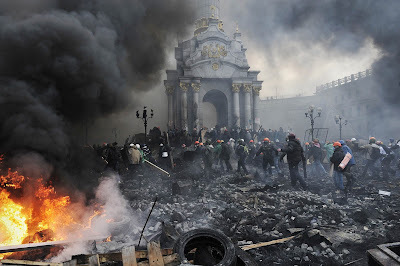 Protesters advance towards new positions in Kiev in 2014. Nearly two years after Ukrainian protesters drove out their pro-Russian leader, progress toward building a European-style state has disappointed and the post-Soviet scourge of corruption endures. Allies of the deposed Viktor Yanukovych are bidding to make a comeback. For French businessman Jean-Noel Reynaud, the situation has led to what he calls an illegal takeover at one of his vodka plants. “Ukraine isn’t fulfilling its commitments to clean up the country," Reynaud, chief executive officer of Paris-listed Marie Brizard Wine & Spirits, said in a phone interview. With the attention of world powers trained to the Middle East, the struggle over Ukraine’s future is shifting away from the battlefield near its border with Russia, as optimism builds that a truce there will hold. Failure to make a dent in graft risks eroding support for the leaders that took charge after the revolution and further damaging confidence in an economy crying out for investment. Local elections on Oct. 25 will be a chance for the nation to deliver a message to the government, with two thirds of Ukrainians saying the country’s heading in the wrong direction. The lack of momentum in revamping Ukraine has shattered support for the ruling coalition, led by President Petro Poroshenko’s party, according to a September poll by the International Republican Institute. Controlling a third of seats in parliament at present, the Solidarity Party would get 13 percent in elections for the legislature, the survey showed. The party of his prime minister, Arseniy Yatsenyuk, ranked in April by one newspaper as Ukraine’s least reform-minded politician, isn’t even contesting the local ballot. Luckily for Poroshenko, the opposition is divided between populists, nationalists and backers of the former regime, while presidential and parliamentary elections aren’t due until 2019. That distance helps to insulate him from a growing chorus of discontent, which includes businesses that complain officials are resisting change to protect vested interests of corporate allies and oligarchs. Andrey Pavlichenkov, who manages a $100 million bond fund with investments in Ukraine, has seen no streamlining of the country’s bureaucracy. He said difficulties including raider attacks and overbearing checks by prosecutors and the security service haven’t gone away, and he fears the government isn’t doing enough to make foreign investors return. “Ukraine isn’t attractive enough as an investment destination that such problems can exist," he said. "Bureaucrats have no idea how to regulate and just look for ways to get a bribe -- the system doesn’t want to change." Ukraine is relying on an $18 billion restructuring of its foreign debt and $17.5 billion loan from the International Monetary Fund to revive an economy that hasn’t grown since 2013 and help restore confidence in the past year’s second-worst-performing currency, the hryvnia, which has plunged 42 percent against the dollar. Lenders have made the flow of bailout cash contingent on continued reform and inroads into corruption. The U.S., which has provided $2 billion of loan guarantees on top of the IMF rescue, has been critical of some elements within Ukraine. "Corrupt actors within the Prosecutor General’s office are making things worse by openly and aggressively undermining reform," Geoffrey Pyatt, the U.S.’s ambassador in Kiev, told a business conference in the the Black Sea port of Odessa last month. "In defiance of Ukraine’s leaders, these bad actors regularly hinder efforts to investigate and prosecute corrupt officials." Davit Sakvarelidze, a deputy prosecutor general, says it’s harder to stamp out corruption in Ukraine than his native Georgia, which shot up Transparency International’s rankings under then-President Mikheil Saakachvili. Saakashvili, named this year by Poroshenko as Odessa’s regional governor, has sought to curb corruption in the local customs service, falling out with Yatsenyuk in the process. Ukraine is 142nd-lowest of 175 nations in Berlin-based Transparency’s latest corruption survey, six places below Russia. "You have a lot of interests, a lot of oligarchic clans that control politicians, members of the government," Sakvarelidze said in an interview. While Poroshenko has pledged to reign in tycoons such as Ihor Kolomoyskyy, the president was himself a billionaire when he was elected and hasn’t fulfilled promises to sell off assets that include Ukraine’s largest candy business. Ukraine is moving ahead with reforms to eliminate corruption, outsource customs functions to an international company, overhaul courts and sell off state-run companies, according to Boris Lozhkin, Poroshenko’s chief of staff, who said the nation may be enjoying a period of relative peace as President Vladimir Putin seeks to have EU and U.S. sanctions against Russia lifted. “We’re working on all of these kinds reforms at the same time,” he said Oct. 13 in an interview in his office in Kiev. He said results were more likely next year, when more funds arrive from the EU and the U.S. While the IMF has praised progress on economic measures, such as creating an anti-corruption agency, it says "significant" challenges remain. "It is essential to stay the course of reform and, indeed, deepen the effort," IMF managing director Christine Lagarde said last month in a statement. Reynaud, the French CEO, vows to continue fighting for the factory his company has lost. He’s banking on a positive outcome in local courts having sought help from Poroshenko’s administration and the French embassy in Kiev, which is tracking the case along with the European Commission. But Reynaud has a warning for the nation’s current leaders. “I hope Ukraine will be able to join the EU one day," he said.